I was working in a very long Word document (18 pages) and needed to edit one tiny word because I had misspelled a name. At first I scanned the pages, trying to locate which section it was in. I couldn’t find it. It was taking up time. Then I remembered the Find command (Ctrl+F)! It saved me a lot of wasted moments and prevented me from an embarrassing mistake by finding even more than I expected. Later, I had a web page open, and I was looking up a shortcut for opening the Start menu. I had done an Internet search and found the right source, but the problem was that the article was long and busy. I couldn’t find the reference to the Start Menu. This is another type of situation where the “Find on page” command came in handy. I picked a word (or a phrase) … in this case, “start”… I typed in Ctrl+F (the Find keyboard command) and there it was! Highlighted for me to see easily! You can save a lot of time and frustration by using the easy Find command. File managers (Windows Explorer, File Explorer). See details on this below. In these first two, the Find command takes you directly to the place on the page where the information is located. The text you search for will be highlighted. Simply hit Ctrl + F. It’s easy to remember as “Find” starts with “F.” Or, in the Home ribbon, in the Editing section, click on Find. In Word, a Navigation window will open to the left of the screen with “Results” highlighted. Type your search word/phrase in the box and press Enter. The results will be highlighted. In Excel or PPT, the Find window will open where you can enter your keyword then click Find Next. The results will be highlighted. If there is more than one instance of the keyword or phrase, use the Find Next button to move through the document to find each occurrence. On the page you need to search, click the Ctrl + F keys. The “Find” toolbar will open. NOTE: In some browsers like Chrome or Safari, it opens at the top right of the screen; in Firefox it opens in the bottom left. Type your search word (or phrase) in the box and press Enter. The results will be highlighted. Depending on the browser, you can use the “Next” button or the up/down arrows to find more instances of the word/phrase on the page. 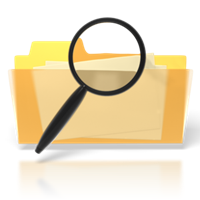 Now that you have memorized the Ctrl + F “Find” command, you can also use it in Windows Explorer (Windows 7) and File Explorer (Windows 10) for doing a keyword search to find documents. When you open your Explorer software and need to Search to find a particular document by keyword or phrase, try using Ctr + F to make your cursor jump right into the search box. Full disclosure, the Search box will be visible in the upper right of the screen, but Ctrl + F is a handy keystroke to expedite the process! Then perform your search. All files with your terms in the name of the document, or within it, will be displayed. Below you see the word database in the name the file or the location. 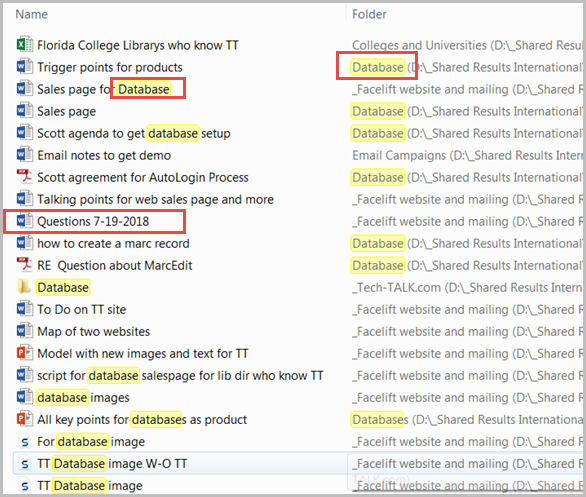 Where nothing is highlighted in your results, it means the term is within the document. NOTE: For more Tech-Talk articles on finding documents, go to the archive library and put “search files” in the keyword search box. I LOVE THIS FEATURE. I USE IT ALL THE TIME.